Although diesel engines are known to be superior to other internal combustion engines in terms of lower fuel consumption and better energy release efficiencies, they are associated with significant amounts of particulate emissions. The particulates largely comprise soot, which is formed in the fuel rich regions of the burning diesel jets. Increasing environmental concerns and stringent emission standards require the development of both conventional and unconventional means for reducing soot. Studies in this area have focused on improving the engine design and incorporating special filters and treatment units at the exhaust end of the vehicle. Dr. Rahul Vaish, Associate Professor, School of Engineering at IIT Mandi and his research students Vishvendra Pratap Singh and Moolchand Sharma have looked at this problem from a different perspective. They rationalized that while it is impossible to bring down soot emissions to zero, it is possible to find a use for the soot produced. It is known that carbon species can adsorb various organic pollutants in water. Carbon nanotubes, filter paper, mesh films, and graphene have been used for removing oil from water. 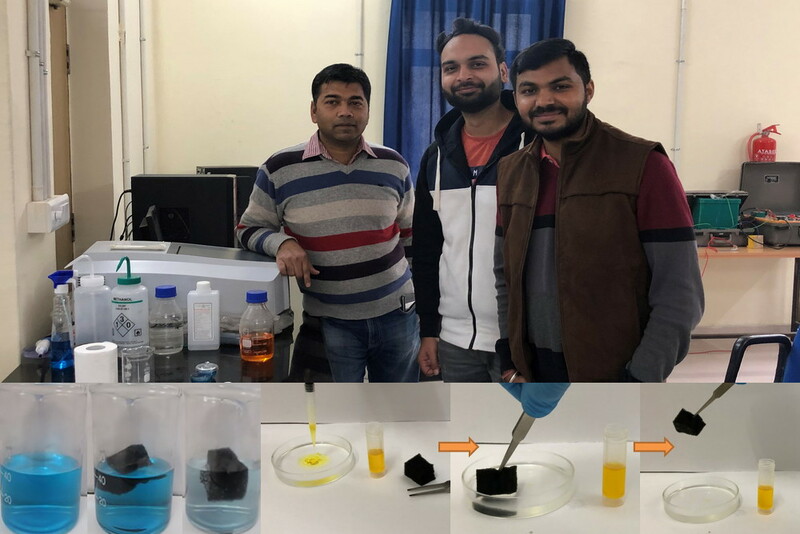 Given that the typical carbon content of soot is between 90 and 98%, the team explored the possibility of using this pollutant as an adsorbent of oil and organic contaminants in water. “There is a rapid increase in oil and chemical leakages from oil tankers or ships and industrial accidents with expansion in oil production and transportation in the last few decades”, the authors write in their recently published paper, justifying the need for new materials to mop up oil and prevent catastrophic environmental outcomes. In an earlier study, Dr. Vaish used candle soot to successfully remove two cationic dyes, rhodamine B and methylene blue from water, thereby showing the possibility of organic chemical removal by soot. Extending this earlier work, the research team incorporated diesel exhaust soot into polymer sponges to study their capability to absorb oil and other organic materials from water. This hydrophobic sponge showed high absorption capacity for various oils, without a need for complex pretreatments. The researchers found that the highest oil absorption capacity was 39 g/g for engine oil. An interesting observation was that the sponges were recyclable and retained 95% efficiency even after 10 cycles. The diesel soot impregnated sponge could also absorb pollutants like methylene blue, ciprofloxacin, and detergent from the water. This has practical implications. “Apart from oil spills, organic pollutants such as traces of dyes and detergent coming from industries and households are a major contributor to water pollution”, says Dr. Vaish. The soot impregnated sponge can help in developing cost-effective remediation processes for common domestic and industrial pollutants. Such a development would additionally serve to repurpose automobile waste.